Removing unwanted stumps from your property is neither simple task nor something you should try to do on your own. Stump removal can be vey dangerous and should only be done by trained professionals. At High Point Tree & Fence, we specialize in stump grinding and removal so that you don’t have to stress about it. Do you have a stump, or multiple stumps, on your property that you’re tired of looking at? Worry no longer! Call us today for stump removal in High Point, Greensboro and Winston-Salem, NC. 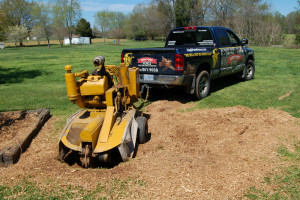 We offer trusted stump grinding and removal services to the entire Triad. High Point Tree & Fence only employs trained professionals. For all tree work, including stump grinding and removal, you can be confident that your property will be well-taken care of. Stump removal is dangerous, but we take all necessary precautions to ensure each stump is removed safely and without causing any damage to your property. Whether you have just one stump or several stumps that need to be removed, we can handle the job. If you’re in High Point, Greensboro or Winston-Salem, NC, turn to the stump removal services at High Point Tree & Fence. Based in Archdale, NC, High Point Tree & Fence services the entire Triad area. We strongly urge to stay away from any form of stump grinding or removal work if you’re inexperienced in the field. For stump removal services you can count on in High Point, Greensboro or Winston-Salem, NC, call High Point Tree & Fence today. Whether you have just one stump or several stumps that need to be removed, we can handle the job.